We are still on Spring Break so we have been eating out a lot during lunch and then eating light meals or leftovers for dinner. 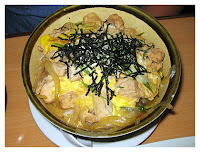 Today, my son request a Japanese favorite of ours and a comfort food...Oyako Donburi. It is a Japanese bowl dish of chicken and egg...mother and child...which I believe is the meaning of the name. It is very easy to make. The finishing touch is to place strips of roasted Nori (seaweed) on top. We use the Korean style nori as it is already roaster and salted.